Dozens of people are thought to be trapped in rubble after a factory collapsed in Lahore, Pakistan killing at least 17 people. The factory, which was under construction, has collapsed on November 4. A major rescue operation is under way, cranes and bulldozers are being used and the army is assisting in the rescue efforts. The cause of the collapse is still unknown. Building safety levels are often below standard in Pakistan. Two floors of the factory, in the Sundar Industrial Estate on the outskirts of the city, were operational, while a third was being built. 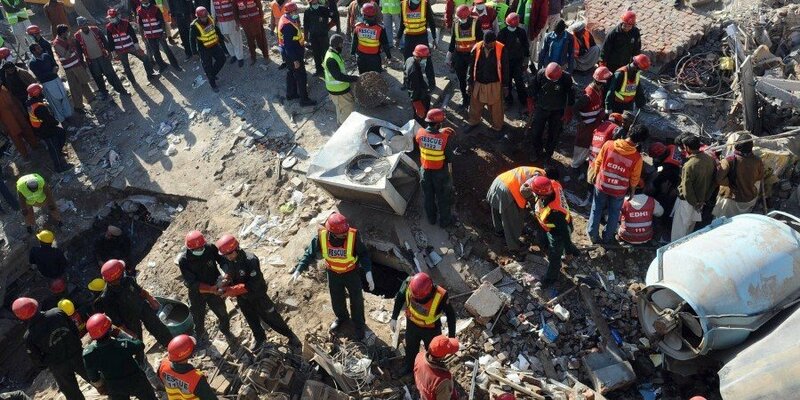 About 200 laborers are thought to have been in the building at the time of the incident, according to Jam Sajjad Hussain, a spokesman for the rescue services. Other estimates in the Pakistani media have put the figure closer to 150 people. Until now, 98 people had been pulled out alive and many were taken to hospital. According to the rescue services, it was difficult to know exactly how many people were still trapped because the owner and administrative employees were among those inside the building. The army has said that it is deploying a team of engineers and experts to take part in the rescue.